Gracie had her eye check up at the hospital on Monday. We are used to these visits because both Gracie and her older sister Elise wear glasses and have to be seen on a regular basis. 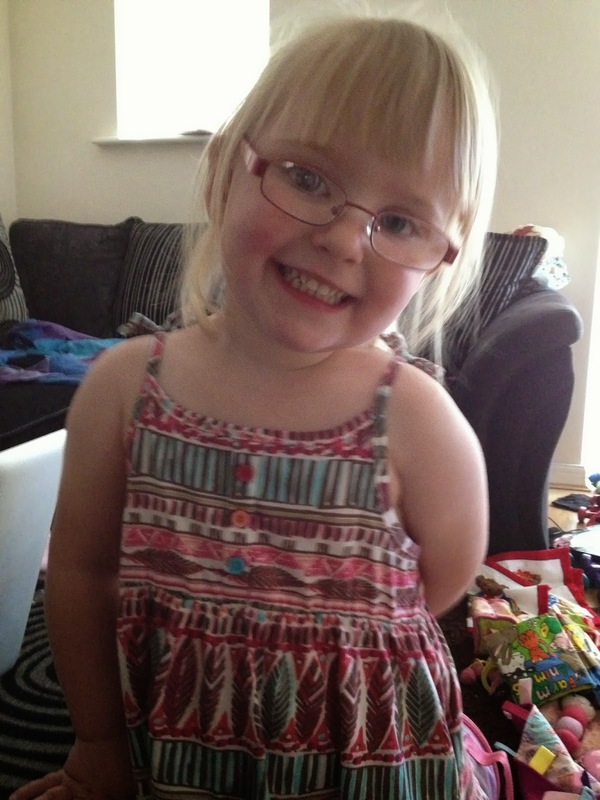 Gracie's older sister has been wearing glasses since just before she was 3 years old and has struggled some what in the past to get the right prescription to not only correct her eye sight but her squint too. Gracie has the same problems with her eyes, just not as severe but we were expecting the same kind of outcome. So I was more than surprised when this time round Gracie really excelled, infact we were told that with her glasses on, she now has 20/20 vision and if she can master her letters by her next visit then she will be discharged from the hospital and can go to a normal opticians for further eye tests. This probably doesn't seem like a massive achievement but the girls eye sight has always been something we have worried about so to us it was huge thing to us and I am so proud of Gracie for wearing her glasses as she should. That's brilliant well done for wearing your glasses gracie and they look gorgeous too! This is fantastic news, and such a relief that all is going well with her eyes. Well done Gracie.